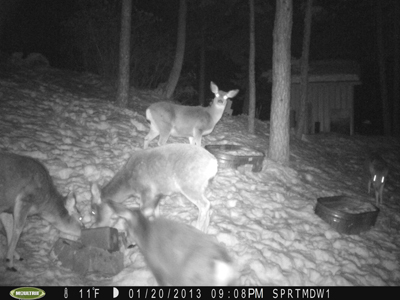 We bought a motion-activated game camera and positioned it where we know the animals congregate when we're gone. These are a couple of the first shots we got from it. In two weeks we had over 550 photos. The idea started when we were out to dinner with friends from North Bend WA and they told us about the wildlife camera he set up on his lot near the river. He has photos of deer, cougar and bear. Actually I had priced trail cameras several years ago and they cost more than I wanted to spend. I investigated again and found they've come down in price. Ours was $89 online. We strapped the camera to a tree near a trace mineral salt lick that we leave out in winter for the wildlife. 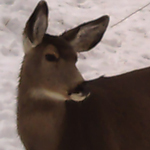 I went back two weeks later to retrieve the memory card and found that the camera had snapped 560 photos of deer. We never knew they were such hams for the camera! We see the same deer year-round. 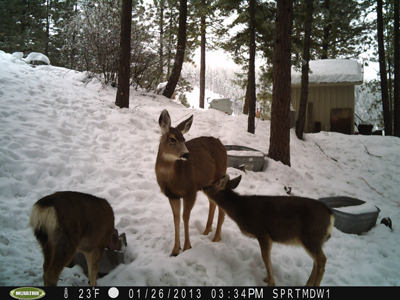 This doe and her two young are frequent visitors. The camera shoots 3-4 pictures when anything activates the infrared motion detector. At night it becomes a night-vision camera with infrared flash. It's also capable of shooting a short video each time it's triggered. There are other options, like shooting every x minutes at dawn and dusk to track migration. That mode saves photos in a special file format that requires installing the manufacturer's software to view them. We got the Moultrie DR55IRXT. The technology hasn't changed since I looked at these cameras many years ago. A weatherproof outer case protects the camera from rain and dew. The camera runs on C batteries (or an AC adapter if power is available at the camera site). The still images are 2560x1920 and decent quality for the purpose. You can connect the camera to a PC via USB cable, or pull the SD memory card and transfer photos that way. The full-size SD card (up to 32 GB) is not included with the camera; they're about $20 new, if you don't have one from an old digital camera. I'll post more when we get more interesting wildlife photography. We intend to move the camera around the property to capture birds and other animals.